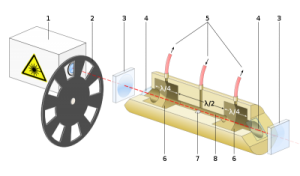 Photoacoustic Spectroscopy – COPAC-Copenhagen Photonic-Acoustic Corp.
Laser-based photoacoustic spectroscopy is an emerging technology with great potential for industrial applications. Laser intensity or wavelength modulations corresponding to an absorption line of the contamination species excite weak acoustic waves in gas media. 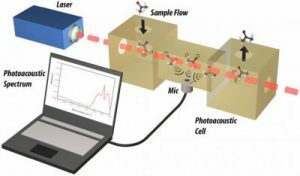 Using high sensitivity condenser microphones as detectors, the photoacoustic arrangement can be constructed compactly with high sensitivity for chemical detection. COPAC has many years of expertise in photoacoustic spectroscopy and can supply a photoacoustic gas analyzer that suits your needs at a reasonable budget. See our laser gas analyzer webpage.